Back to blogging, (my life is now sharks). Good morning world, I’m writing this from a cafe in Cornwall, drinking my fourth or fifth coffee of the day, just outside Falmouth where I lived up until recently. I’m currently on a break from my new job & home, and am trying to use this time to catch up on all things that I’ve let slide whilst I’ve been working, such as writing, drawing, etc. I now live in South Bimini, the Bahamas, a tiny island only 50 miles from Miami, and very far away from the rest of the Bahamas, and also anything I’ve been used to. Anyway, back to Bimini. The Sharklab is a world renowned field station, now in it’s 25th year. There’s a number of permanent staff, and a rotation of volunteers, and we all live and work in very close quarters within the same building. We work long hours, we get few days off, have minimal personal space, and we live on an island where there’s only 2 restaurant/bars, one very small store, and an airport. But, we get to work with sharks. I’ve never been shark obsessed; I make no secret in the fact that I love all kinds of marine life, and could never choose a favourite, but since working at the lab, I love sharks a hell of a lot more. My experience with sharks was minimal before working here, I’d dived with them a few times, and thought they were pretty cool, but in all honesty I didn’t know much about them. Now I’m lucky enough to live surrounded by scientists, conducting numerous research projects on a range of the species we get around Bimini. I’m happy to say I’m learning a lot more biology, and loving being around active science and being involved in projects that ultimately contribute to marine conservation. My role is varied, and I won’t go into the details of that too much, but a part of it includes generating media content, and documenting the work we do, i.e. a fair amount of photography. 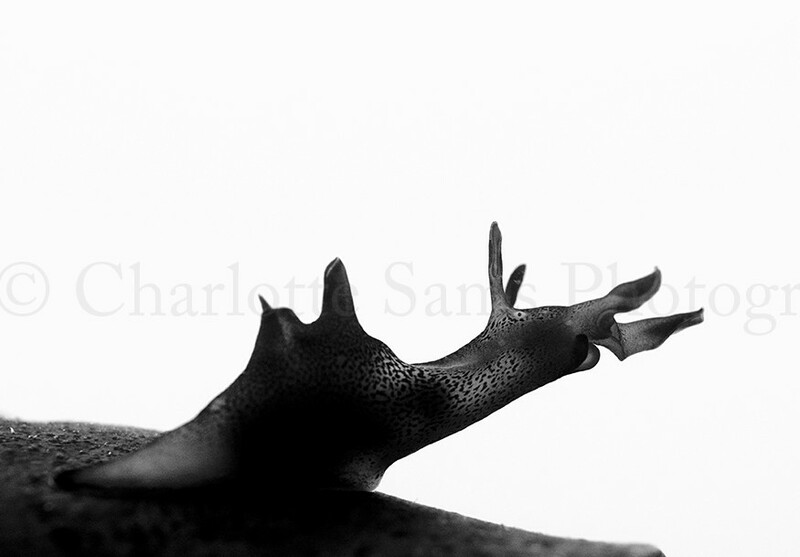 And this is what I’ll be focusing on in the coming weeks in this blog, sharing one or two images of a specific species, with a little about the story behind the image(s). 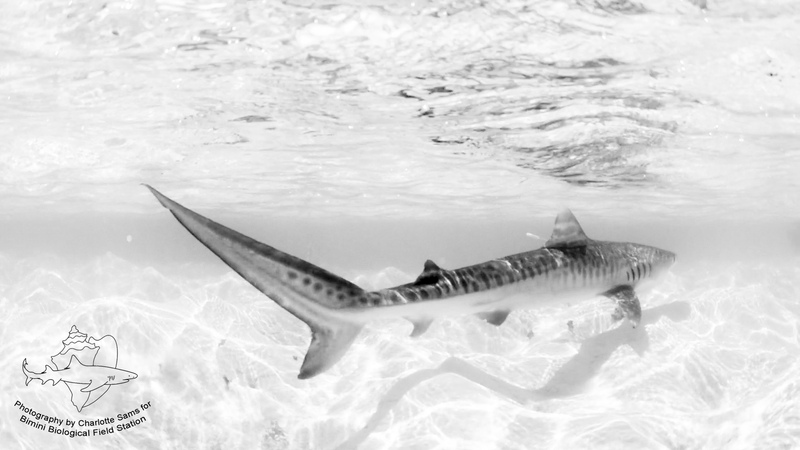 The first shark I encountered in Bimini was a juvenile tiger shark. I was lucky enough to arrive around the time of our monthly longline set. And before you panic, this isn’t the usual kind of longlining that you may have heard as being awful, this is shallow water, very small scale longlines, that are checked every few hours. You can read more about it on the lab’s website here (http://www.biminisharklab.com/research/researchtechniques). Tiger sharks, Galeocerdo cuvier, are fairly common around here, and as a species worldwide they are listed as near threatened by the IUCN. We encounter juvenile, semi adult, and mature tigers, unlike some of the other species we work with around here. That’s my first ever tiger shark image, and definitely not one of my best, but it sets the scene for you. (It’s not always that calm and sunny out there as well!). This is my favourite juvenile tiger shark image to date, which is in fact a screenshot from a clip, filming the release of this individual after a work-up whilst one of our college field courses were visiting. 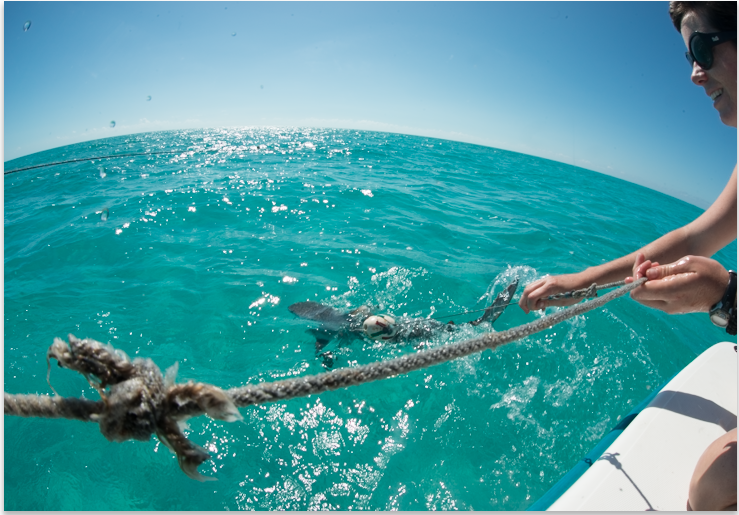 A work-up varies on details, but involves taking data for each individual shark; measurements, DNA & isotope samples. Also, we tag our sharks with PIT tags, an ID tag like a microchip. They sometimes are implanted with acoustic transmitters, meaning we can pick up their movements on receivers we have around the island. I love the patterns on juvenile tigers, look at those spots on the tail! Seriously beautiful. Since living in Bimini, I’ve worked with adult tiger sharks too, but honestly I don’t have anywhere near as many photos of these yet. This is something I’m hoping to improve upon in my future at the lab, and safe to say I’m excited to see what this adventure brings! Thanks for reading! Lemon sharks will be featured next!